The 1969 Intercontinental Cup was a two-legged football match contested between 1968–69 European Cup champions Milan and 1969 Copa Libertadores winners Estudiantes. It was the 10th edition of the competition. The first leg was played at the San Siro in Milan, on 8 October 1969. Milan won the home game 3–0. The return leg was held two weeks later, on 22 October, at La Bombonera in Buenos Aires. Despite suffering a 2–1 defeat, Milan won the title on aggregate. Nestor Combin after pummeling in Buenos Aires. Amongst other things, the tie became infamous for the violent on-pitch conduct and dirty tactics employed by Estudiantes's players in the second leg of the fixture. 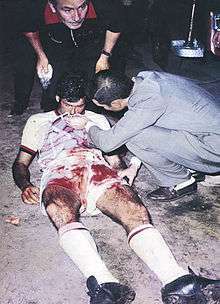 After a match which saw two Italian players badly assaulted, events took a turn for the surreal when stretcher-bound AC Milan striker Nestor Combin was arrested by Argentine police for draft dodging (Combin had been born in Argentina but had represented France at international level, having moved to Europe for his professional career). The match had immediate political ramifications, partly due to Argentina's bid for the World Cup in 1978. Many of the team's players were arrested and goalkeeper Alberto Polletti, who had punched Milan's golden boy Gianni Rivera, kicked Combin and had clashed with supporters after the match, was handed a life ban. Ramon Suárez, who had broken the nose of Combin, was banned from international fixtures for five years. The match is also partly to blame for a subsequent boycott of the tournament by European teams. ↑ Adams, Tony. "Rewind to 1969: Estudiantes Leave Their Mark". ESPN. Retrieved 13 December 2012.